It’s not on the beach. There are better entertainment options elsewhere. But you can’t truly understand Tel Aviv without experiencing Neve Sha’anan. A couple of weeks ago, I went for a walk in the Neve Sha’anan neighborhood of Tel Aviv with a friend of mine, a student of architecture and urban planning at the Bezalel Academy of Arts and Design. He wanted me to give him an unofficial tour of the neighborhood, and I wanted the same thing from him. I was getting ready to write this article about it, and he was preparing for a school project. I had the knowledge that comes from living in the area for three years; he had the knowledge that came from an academic study of the area. I pointed to areas of intrigue and interest. I told him how, at the center of Levinsky Park, there is a freestanding wall. You can reach it through a crowded garden that is a popular hang-out for asylum seekers, a sleeping ground for the homeless, and a meeting place for events and rallies. Upon closer inspection, however, the wall turns out to be a volunteer-run library with books in 18 languages. Continuing on, we walked past Akko Street, a tiny road lined with small commercial warehouses used as housing by African asylum seekers and perpetually haunted by junkies. We continued down Chlenov Street, past number 5A, a junkie squat where garbage is always spilling out on to the pavement. We took a left on to I.L. Peretz—my street—passing a mix of new condo developments and old crumbling buildings. Having a street named after you is, I imagine, a mixed blessing so far as honors go. This is because one never really knows what’s going to happen to your namesake. While the name is initially a reference, it soon refers to nothing other than itself. I don’t know who Chlenov was, but I know the filth and chaos of the throughway that was given his name. Then there is Har Tziyon (Mount Zion) Street, which has the unique effect of conjuring up the dual images of the biblical mountain and the succession of cheap furniture stores that characterize it today. Finally we crossed over to Neve Sha’anan Street. The words “Neve Sha’anan” evoke a strange mixture of images and meanings. 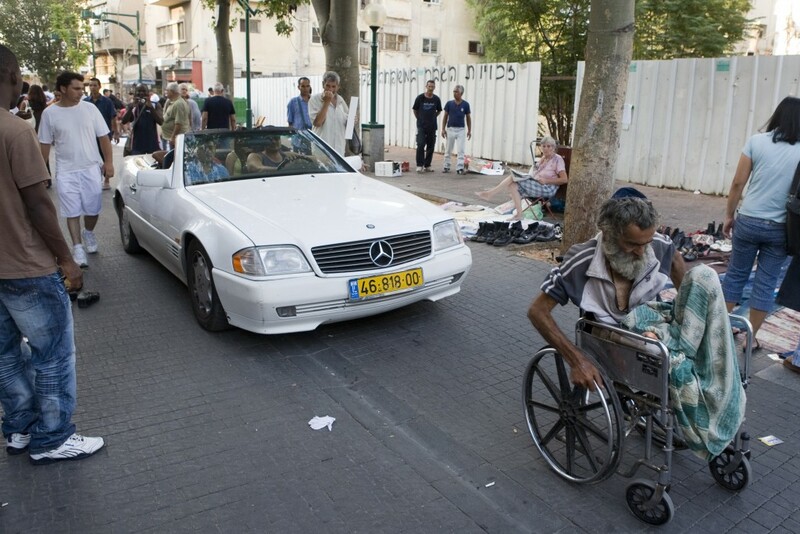 For Tel Avivians familiar with the neighborhood, the association with asylum seekers, poverty, and squalor is immediate. And yet the words themselves mean “peaceful abode,” and have a soft, whispering quality to them. Still, I am well aware of the neighborhood’s turbulent past. A twisted metal street sign is an unrepaired reminder of a 2003 terrorist attack in which 15 Israeli citizens and eight foreign residents were killed. This was only a year after another attack in which two of the three killed were migrant workers. But this is only one small fragment of Neve Sha’anan’s story. I also worry that the neighborhood’s unique attributes, the things that make it special and vital, are too tangled up with its problems, making it dangerous to proceed with large scale urban interventions. Indeed, the neighborhood is a center for outsider communities. Israel’s African asylum seekers—mostly from Eritrea and Sudan—are heavily represented. There are also migrant workers, mostly from the Philippines, with others from India, Nepal, China, and Eastern Europe. 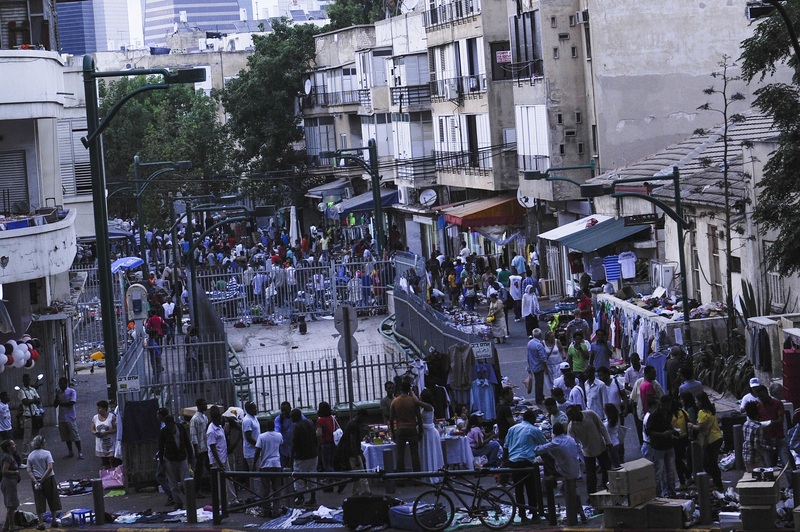 There are small communities of French and American Jews who have immigrated to Israel. Along with them are a gay community, a trans community, and a junkie community. The problems of the neighborhood are clear for all to see. Even a quick walk through the area will reveal them: Poverty, neglected infrastructure, drugs, overcrowding, unsafe conditions. What solutions can urban planning provide for such problems? Quite a few, actually, but the question then becomes who these solutions will ultimately benefit. A tough neighborhood can always be revitalized, but often, this simply paves the way for gentrification. Until urban planning can solve the problem of poverty, how can planners solve the problems of a poor neighborhood? 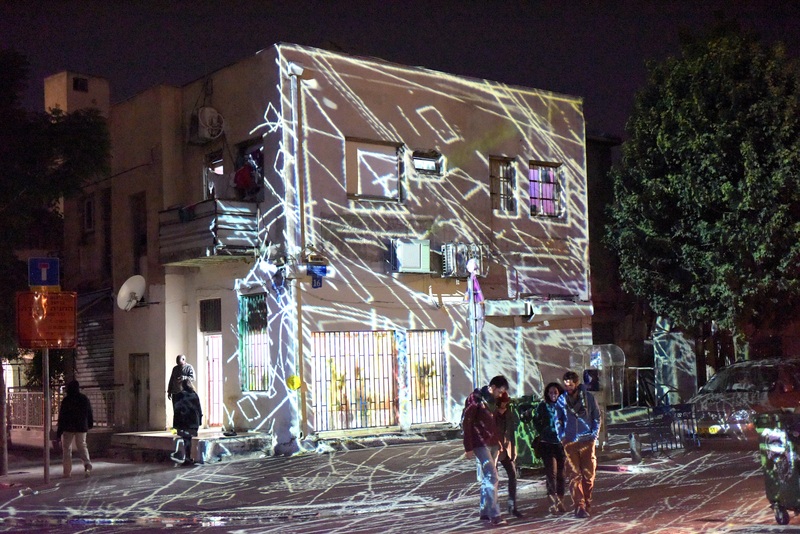 At a glance, Neve Sha’anan Street resembles the best of Tel Aviv’s pedestrian roads. It is cobbled, like the ever-charming Nahalat Binyamin, and large globular lamps hang on gently curved lampposts. It has more foot traffic than any other street in the city. Its Eritrean and Sudanese restaurants, bars, cafés, and barbershops are crowded with people. Despite the evident troubles of the people living here, the strength of these communities is apparent. At one café, a small corner is dedicated to letters and packages for asylum seekers, many of whom are homeless. Alleyways are converted into market stalls. No inch of public space goes unused. 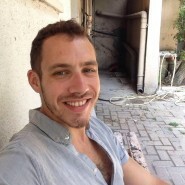 The asylum-seeking community has received little in the way of official governmental support, so they have found unique ways of supporting one another. African asylum seekers have no permanent legal status in Israel—a vanishingly small number of them have been granted official refugee status—but the government has agreed to look the other way when it comes to employment. Their businesses are officially owned by Israelis, but operated by the asylum seekers themselves. One word frequently used to describe this area is “neglected.” But for people who fear detention and deportation, neglect is often a better fate than interventions that do not serve their interests. In fact, the street is cloaked in a sense of quasi-legality. Many of the buildings would surely be condemned if they were inspected. The rents for these dilapidated apartments are surprisingly high. Foreign communities want to stick close together, increasing the demand for housing in this densely populated area. Adding to the problem is the unchecked impunity with which many building owners in the area refuse to rent to African tenants. Many of the buildings have not been renovated since they were built, in some cases nearly a century ago. That the residents of Neve Sha’anan deserve affordable, clean, and safe housing is undeniable. But the increasingly frequent demolitions of preexisting buildings in the area to make room for larger, taller condominiums serve other interests. Neve Sha’anan is on the threshold of a great transformation. Buildings like the one I live in are signs of impending change. On the site of the old Central Bus Station, a new residential tower will soon be built. While these new buildings are now mostly populated by Jewish immigrants and young, gay Israeli men, the sense seems to be that the processes of gentrification now transforming the nearby Florentin neighborhood and the Levinsky Market will spill into Neve Sha’anan as well. This could mean an end to the neglect Neve Sha’anan has always suffered. In ten years it may be one of Tel Aviv’s more hip and desirable locations. But as with most urban legends, what’s cast as transformation is actually a trick in which a neighborhood is not truly renovated but rather reshuffled, pushed farther back into the shadows, where the neglect can continue. This neglect has deep roots. Neve Sha’anan was founded in 1921 by a group of 400 Jews who wanted to take part in the establishment of the new Hebrew city of Tel Aviv. Many of the founders were new immigrants—European and Mizrahi Jews. Others were internal refugees who had been displaced from Jaffa and other predominantly Arab areas. The neighborhood, then, has two parents. One is Jaffa, which supplied many of the early residents, building styles, and sensibilities. The other is Tel Aviv, which lent the founders’ enthusiasm a secular Zionist utopianism. But residents of Jaffa felt Neve Sha’anan had gone too far toward the gleaming, modernist Tel Aviv, while the Tel Avivians saw the neighborhood as inextricably connected to the old-world city of Jaffa. Both parents, in other words, distanced themselves from their offspring. Having secured funding and loans, Neve Sha’anan held a contest for neighborhood planning. The winner was urban designer David Tischler, who envisioned a menorah with Levinsky Street as its shamash and seven curving branches made from the Yesod Hama’ala, Neve Aha’anan, Hagdud Ha’Ivri, Commercial Centre, Wolfson, Ha’Kongress, and Shivat Zion streets. The plan also included small abutting agricultural lots as a way of stimulating the area’s economy. These lots proved, in the end, too small to generate a livelihood for the residents and fell into disuse. From this small, eager beginning began a series of disastrous planning strategies, most of which took little account of the residents. One of them, documented in Nissim Davidof’s anthology of writing on Neve Sha’anan, Hanoch Levin’s Tel Aviv, was a 1938 master plan devised by Yakov Ben Sira, which designated parts of southern Tel Aviv for industrial use only. 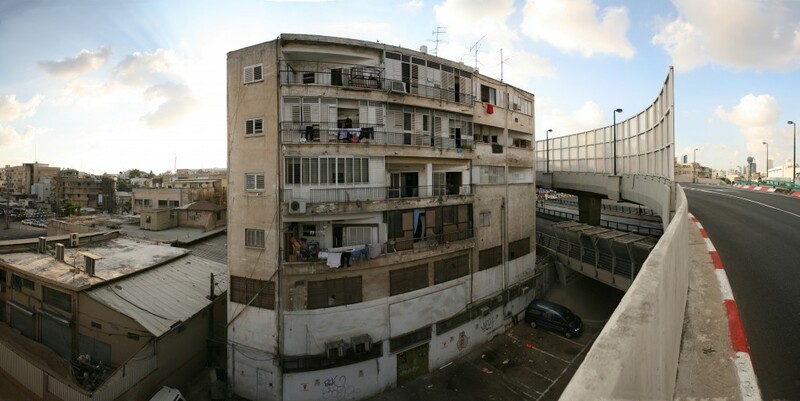 Referencing the movie Metropolis, a tale of a future urban dystopia, Davidoff writes, “[Tel Aviv] attempted to distance the ‘machine level’ outside the range of vision.” This is why much of Tel Aviv’s heavy infrastructure has been situated in and around Neve Sha’anan. The designation as an industrial area made it nearly impossible to build new residential buildings, and created miles of red tape for owners wishing to renovate or improve their existing properties. It did not prevent people from living in this so-called industrial area, but it did put a stranglehold on development. This would be followed, of course, by the even more disastrous construction of Tel Aviv’s New Central Bus Station—a sprawling monstrosity whose construction took over twenty years to complete and ultimately yielded one of the most heavily criticized structures in Israeli history. Years of noisy construction and the pollution it caused saw property values plummet throughout the surrounding neighborhoods. The area slowly became infamous. 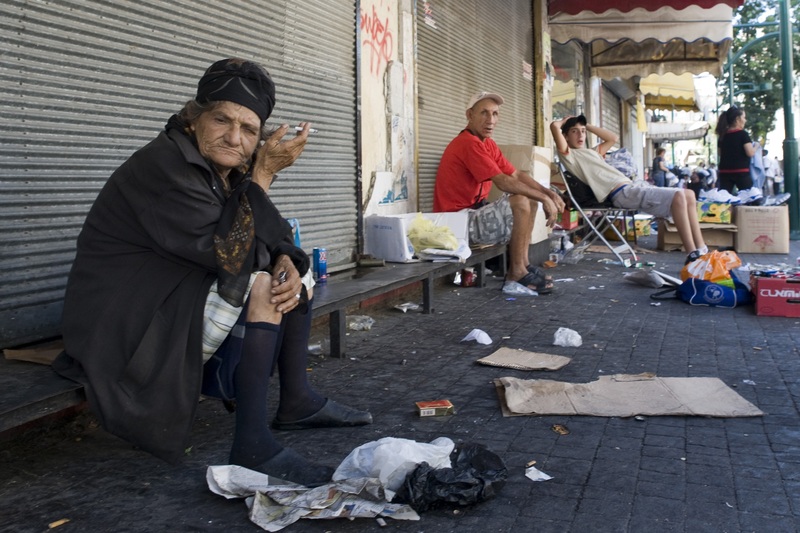 As Neve Sha’anan acquired a reputation as an undesirable and even dangerous place, it became the home of Israel’s foreign workers, junkies, and prostitutes. When asylum seekers from Africa began arriving to Israel in large numbers in 2007, many were indiscriminately sent to the New Central Bus Station, leading them to settle mostly in Neve Sha’anan. The rapid changes to the neighborhood were not welcomed by the Jewish residents of the area, who felt their government had sold them out and let their home become a slum. Here, in the first modern Hebrew city, Jews felt like a minority. For me, however, Neve Sha’anan has always been a place more beautiful than ugly; more alive than dead. It’s not helpful to romanticize the neighborhood, because the problems of neglect, safety, poverty, and drugs deserve to be addressed in good faith. But the dangers of romanticizing Neve Sha’anan are outweighed by the dangers of failing to see it’s vitality and dismissing it as a slum. To do so would ignore its unique liveliness and bustling, communal street life. It would miss the way children play in the streets and the unique effects of density and diversity as a second generation of foreign residents and asylum seekers comes of age. It’s not a rare sight on I.L. Peretz Street to see a group of African, Filipino, and Arab children playing soccer together, all of them conversing in Hebrew. To dismiss Neve Sha’anan is to ignore the strength of its communities, many of whom have come from far away and endured difficult circumstances both in their countries of origin and here in Israel. A planned urban area, like those seen in other parts of Tel Aviv, can be experienced as a form of aesthetic homogeneity. Neve Sha’anan, despite its issues, has life and diversity. Much of this is attributable to a history of blunders. It is an accidental city. It has become not what it was planned to be, but the mirror image of a variety of failed and abandoned planning schemes. In dismissing Neve Sha’anan, we lose the ability to think rationally about the urban policies that continue to be applied to it. Turning slightly toward the west, one can appreciate the type of development happening close by. The Levinsky Market has never looked better. It has preserved its historic character while making room for new cafés, restaurants, and shops that seem to complement rather than contradict its past. Development and change are inevitable, and not always negative. New planning schemes come and go, and neighborhoods will always evolve. This is the way cities work. But a careful examination of Neve Sha’anan is in order. In despising it as a slum, we give free reign to those types of planning interventions that have so often floundered in Tel Aviv. By understanding its history and appreciating it as a vital center of communal life, we can begin to put our support behind solutions aimed at truly improving Neve Sha’anan—for its residents and the city at large.